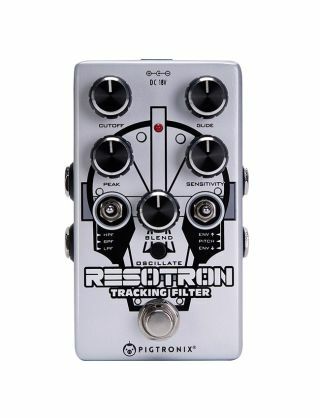 NAMM 2019: Pigtronix has announced the Resotron, an analog filter that, according to the company, “brings the sound of Seventies keyboard synthesizers to an envelope pedal. The Resotron boasts a 24db/octave, state-variable filter that is based on the SSM2040 chip found in the classic Prophet 5 and Octave CAT synthesizers. The filter offers sounds with UP and DOWN sweeping modes, and a sensitivity control to dial in the response of the effect based on how hard the user plays. Additionally, the Resotron employs an analog pitch-tracking system to move the cutoff frequency of the filter up and down based on the notes you play instead of how hard you play. Attack time and rate of filter motion can be adjusted via a GLIDE knob. Other features include hardwired true bypass switching, included 18VDC power supply and a 100% analog design. The Resotron is available for $249. For more information, head over to Pigtronix.